This entry was posted on January 2, 2018 by Jessica Anderson. An example of a Thermo Plaque. A huge shout out to Luke at Thermo Plaques, who was chosen by our staff as Trophies2Go's 2017 'Vendor of the Year'! Based in California, they have been in business for over 46 years! The Thermo Plaque Company creates custom laminated wall plaques from diplomas, certificates, news articles, magazine articles and much more. The plaque edges are sanded, sealed and painted to finish the display. 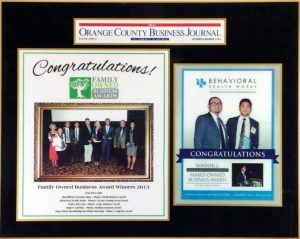 It's a great way to celebrate and acknowledge any accomplishment! 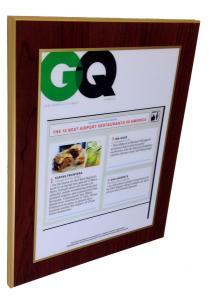 Our customers that order special plaques from Thermo Plaques include Tiger Oak, who does the many Seattle Business Awards, and The Scotsman Guides. An example of a Thermo Plaque made by Luke, our 2017 Customer of the Year! Mike says that Luke is "very helpful, responsive and knowledgeable"
Mika says "Luke gets back to us right away when we request an order, and it super nice and easy to work with. Also really creative. Great products." Janice says "Like is very responsive, he gets back to me quickly. He is quick, he gets the covers done fast for our customers". Our vendors create the components that allow us to assemble and customize the best quality trophies and awards in the industry. Thank you to Luke at Thermo Plaques and all of our awesome vendors for great products to offer our customers!